The reality of being new parents, the greatest juggling act of all. 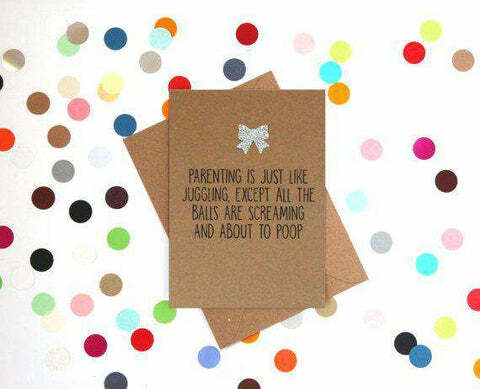 This funny new baby card is perfect for the new Mum and Dad. Our cards are made using only the best quality board. This Funny New Baby Card is printed on luxury 350gsm Kraft board with this unique design. Our cards are A6 size when folded. This card is hand embellished with a silver glitter bow.